CryoSat uses a synthetic aperture radar over areas of sea ice to measure a much smaller footprint than previous satellites. This provides the resolution to identify sea ice floe regions, and open ocean lead regions between floes, and to measure their surface elevations. Over sea ice, CryoSat echoes are assumed to scatter from the interface between the ice surface and the layer of overlying snow [Beaven et al., 1995; Laxon et al., 2013], and we can therefore measure the sea ice freeboard (the height of sea ice above water). 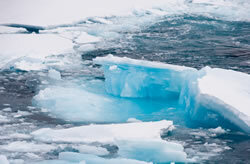 Ice thickness is then calculated using a combination of the freeboard measurements and estimates of snow depth and density derived from a climatology [Warren et al., 1999], assuming that the sea ice floats in hydrostatic equilibrium and that different amounts of snow accumulate on first-year (FYI) and multi-year (MYI) sea ice [Kurtz and Farrell, 2011]. We use Norwegian Meteorological Service Ocean and Sea Ice Satellite Application Facility data (available at http://www.osi-saf.org ) to classify ice as FYI or MYI. We then numerically integrate the product of sea ice thickness, fractional ice concentration and area over monthly intervals and within discrete oceanographic basins to compute regional and hemisphere-wide sea ice volume. To estimate uncertainties in monthly sea ice volume and thickness, we account for uncertainties in the sea ice density and snow loading, and also for spatial variations in the measurement of sea ice freeboard (by far the smallest error source we consider). Finally, to assess their accuracy, we compare the CryoSat-2 observations to independent estimates of spring sea ice thickness from NASA Operation IceBridge [Kurtz et al., 2013] and ESA's CryoVEx campaign [Haas et al., 2009], and year-round sea ice draft from the Beaufort Gyre Exploration Program (http://www.whoi.edu/beaufortgyre). Overall, the CryoSat-2 measurements agree to within 0.5, 21.0, and 10.0 cm on average, respectively, which suggests that there is no significant bias in the satellite retrieval, given that the average spring ice thickness is 2.09 +/- 0.27 m over the CryoSat period. 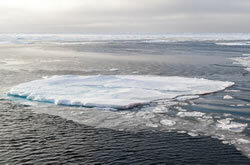 A number of publications by CPOM scientists have documented the evolution of our sea ice retrieval [e.g. Laxon et al., 2003; Peacock and Laxon, 2004; Giles et al., 2008; Laxon et al., 2013], and another has provided a detailed analysis of sources of error and uncertainty in the retrieval of sea ice freeboard from satellite altimetry [Giles et al., 2007]. We calculate Arctic sea ice thickness and volume values from the standard, publically available CryoSat data (https://earth.esa.int/web/guest/data-access), as well as from near real time (NRT) CryoSat data provided directly to us from the European Space Agency. NRT data lack the precise orbit determination of the standard data, and often lack the atmospheric corrections. They also experience a small reduction in coverage. However, our monthly sea ice volumes calculated from NRT and standard data agree to within 0.5% on average, which shows that the NRT data allow us provide users with a reliable operational thickness and volume product. Beaven, S. G. et al. Laboratory measurements of radar backscatter from bare and snow-covered saline ice sheets. International Journal of Remote Sensing 16, 851-876 (1995). Giles, K. A. et al. Combined airborne laser and radar altimeter measurements over the Fram Strait in May 2002. Remote Sensing of Environment 111, 182-194 (2007). Giles, K. A., Laxon, S. W. & Ridout, A. L. Circumpolar thinning of Arctic sea ice following the 2007 record ice extent minimum. Geophysical Research Letters 35 (2008). 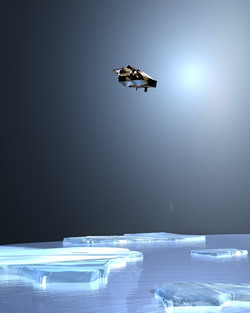 Haas, C., Lobach, J., Hendricks, S., Rabenstein, L. & Pfaffling, A. Helicopter-borne measurements of sea ice thickness, using a small and lightweight, digital EM system. Journal of Applied Geophysics 67, 234-241 (2009). Kurtz, N.T. & Farrell, S. L. Large-scale surveys of snow depth on Arctic sea ice from Operation IceBridge. Geophysical Research Letters 38 (2011). Kurtz, N. T. et al. Sea ice thickness, freeboard, and snow depth products from Operation IceBridge airborne data. Cryosphere 7, 1035-1056 (2013). Laxon, S., Peacock, N. & Smith, D. High interannual variability of sea ice thickness in the Arctic region. Nature 425, 947-950 (2003). Laxon, S. W. et al. CryoSat-2 estimates of Arctic sea ice thickness and volume. Geophysical Research Letters 40, 732-737 (2013). Peacock, N. R. & Laxon, S. W. Sea surface height determination in the Arctic Ocean from ERS altimetry. Journal of Geophysical Research-Oceans 109 (2004). Warren, S. G. et al. Snow depth on Arctic sea ice. Journal of Climate 12, 1814-1829 (1999).